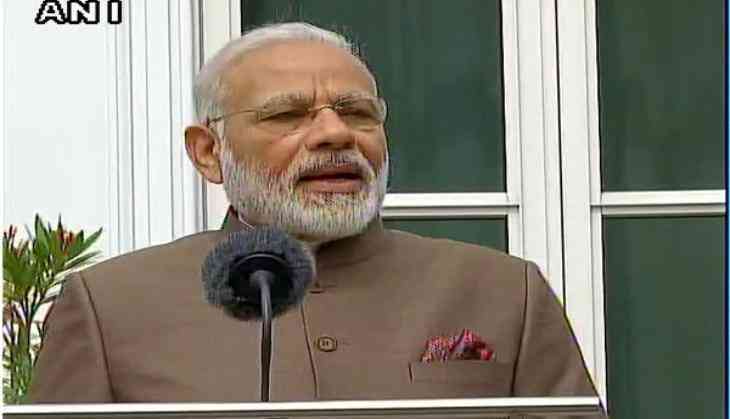 Prime Minister Narendra Modi on Tuesday invited the Non Resident Indians (NRIs) living in The Netherlands to contribute to the development of India. Addressing the Indian community at Sportcampus Zuiderpark here, Prime Minister Modi said his government was committed to make India a developed nation as "the need of the hour is to not only make India progressive but also modernised". He listed out his government's initiatives in this regard. "When I became Prime Minister in 2014, there were 18,000 villages in India where there was no electricity. We took the challenge to electrify these villages in 1,000 days and till date almost 13,000 villages have been electrified," said the Prime Minister. Talking about India's steps in the direction of clean energy, Prime Minister Modi said India has set a target to generate 170 gigawatt (GW) of renewable energy like solar power, wind power, hydroelectricity, biomass and biofuels. While talking about solar energy, Prime Minister Modi also took a dig at erstwhile Congress-led union governments and wondered: "Did the Sun come after I became prime minister?" The Prime Minister also lauded the Digital India campaign and its importance in making India a modernised country. "We have decided to digitialise 2.5 lakh Panchayats so that they are part of modern and digital India," said Prime Minister Modi. He also stressed on women empowerment and women-led development. "The role of women in the agriculture sector, cooperatives is very important. India's Nari Shakti (women power) is contributing to India's progress." Talking about the Mudra Yojna, the Prime Minister said, "Seven crore people have benefitted through the Government's Mudra Yojna and out of 7 crore, 70 percent of the beneficiaries are women." The Prime Minister said his government's decision to provide working women 26-week-maternity leave is actually not a burden, but an investment. "It is an investment and not a burden as the mothers would be raising India's future (children)," said Prime Minister Modi. The Prime Minister also praised the NRIs living in The Netherlands and reminded them they were also ambassadors of India. "The Netherlands is the country which has second largest Indian diaspora in Europe. The officials who represent India in a foreign country are called Rajdoot (Ambassador), but you all are Rashtradoots," said Prime Minister Modi. Inviting The Netherlands' NRIs to invest in India, he said the government was mulling to give a five-year business Visa to them. On a lighter note, Prime Minister Modi asked the Dutch Indian community to download Narendra Modi App "in order to keep your prime minister in your pocket". The Netherlands has the second largest population of people of Indian origin in Europe (next only to the U.K.). It is home to about 2,20,000 Indian and Surinami Hindustani diaspora, wholly integrated into the Dutch society. Although their forebears left India nearly 150 years ago, the Hindustani-Surinami community has deep cultural links with India and is active in promoting cultural cooperation through well-established institutions.